Choupinette @Bukit Timah Road (Singapore) | Get Your Grub On! On the lookout for a quick breakfast before shopping we stopped by ‘Choupinette’, the place with the radiant and colourful sign on Bukit Timah Road. 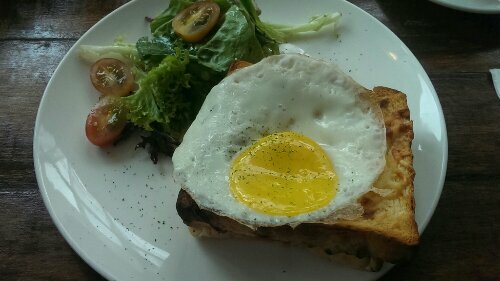 I didn’t have french style breakfast for ages and couldn’t go past the ‘Croque Madame‘ which is pretty much a grilled ham and cheese sandwich topped with a sunny side up. It looked quite neat there with that perfect circled egg and the squarish thick cut double layered toast underneath and taste wise it was pretty good as well. Salty ham, saltier gruyere cheese but unfortunately greatly over-toasted which made it all super dry so that I was really glad I had made my sandwich a “madame” as the runny yolk at least added some moisture to the dish. So flavours were good, execution regrettably didn’t delivery 100% but it’s still a pretty nice place for a quiet breakfast off the Dempsey Hill crowds with very friendly service as well.